Hilton Houston North features an outdoor pool and a 24-hour fitness center. Dining is available at one of the hotel's 2 restaurants. The property also offers a grocery/convenience store. A bar/lounge is on site where guests can unwind with a drink. Wired Internet access is complimentary. This 3.5-star property offers access to a business center. Event facilities measuring 52000 square feet (4831 square meters) include conference space. This business-friendly hotel also offers complimentary newspapers in the lobby, dry cleaning/laundry services, and express check-in. A roundtrip airport shuttle is complimentary to guests during limited hours. Complimentary self parking is available on site. 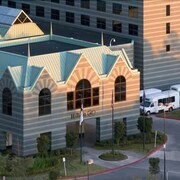 Located in Greater Greenspoint, this hotel is within 12 mi (20 km) of Houston Grand Prix, Willowbrook Mall, and Houston Methodist Willowbrook Hospital. Sam Houston Race Park and Splashtown are also within 12 mi (20 km). Along with 2 restaurants, this hotel has an outdoor pool and a 24-hour fitness center. Free wired Internet in public areas, free self parking, and a free airport shuttle are also provided. Other amenities include a bar/lounge, WiFi in public areas, and a business center. All 480 rooms provide conveniences like refrigerators and coffee makers, plus pillowtop beds and LCD TVs with cable channels. Other amenities available to guests include MP3 docks, WiFi, and wired Internet. Hilton Houston North offers 480 air-conditioned accommodations with MP3 docking stations and laptop-compatible safes. Beds feature pillowtop mattresses. 37-inch LCD televisions come with premium cable channels and video-game consoles. Refrigerators and coffee/tea makers are provided. Bathrooms include shower/tub combinations, complimentary toiletries, and hair dryers. In-room wired and wireless Internet access is available for a surcharge. Business-friendly amenities include desks, complimentary weekday newspapers, and phones. Additionally, rooms include complimentary bottled water and irons/ironing boards. Housekeeping is offered daily and hypo-allergenic bedding can be requested. The Cafe - This restaurant serves breakfast and lunch. Open daily. Starbucks - This café serves breakfast and lunch. Open daily. Vino - This restaurant specializes in Italian cuisine and serves dinner only. Open daily.